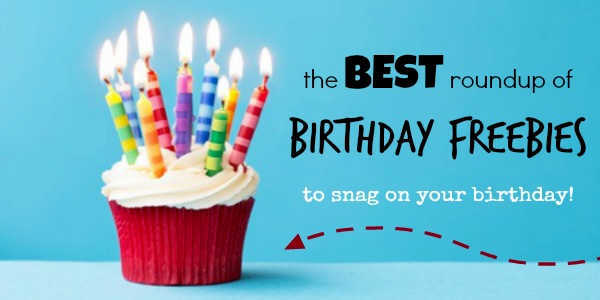 If you or a loved one will be celebrating a birthday soon, you’ll want to check out all of these places that will give you birthday freebies on your special day. Everyone loves free stuff and what better day than on your birthday! Did you know that there are tons of places that will help you celebrate for free on your birthday? There are so many places that will present you with a nice little reward on your birthday! I just had my birthday and one of my favorite things is getting all the free stuff. 😉 From free meals and entrees to free dessert and more, there are tons of birthday freebies to enjoy. A lot of these offers can be used several days after your birthday or even all month long. So you can celebrate all month long! Don’t let these amazing freebies go to waste. 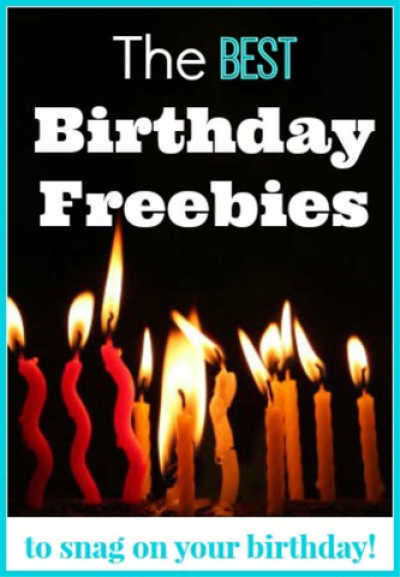 Sign up and watch your inbox for really terrific freebies on your birthday. Also, don’t forget to sign up the kiddos too. Many places offer freebies for the kids and it is a fun treat on their birthday. Sign the entire family up and you all can celebrate big on everyone’s birthday. I love to save money and with 8 kids these offers really help. We can enjoy lots of great treats and free meals and really celebrate on their birthdays. These offers save a ton of money plus it is just so fun. There are great birthday freebies for adults and kids! It pays to sign up for your favorite restaurants rewards program and get a free birthday treat! In fact, you always want to sign up to be a rewards member at your favorite places to dine or get dessert. Once you sign up for emails, you often get other nice offers during the year. You can look forward to getting a gift on your birthday in the form of a coupon for a free meal and more depending on the place! Some of our favorite offers have included a free meal on your birthday, free ice cream, gift card, free birthday gift and more! The free food is amazing and even if you just get a free drink it is nice! These restaurants make it so easy and usually you just show the coupon. Some places may ask to show your id so keep that handy just in case. Get ready to receive a free treat on your special day during the month of your birthday. 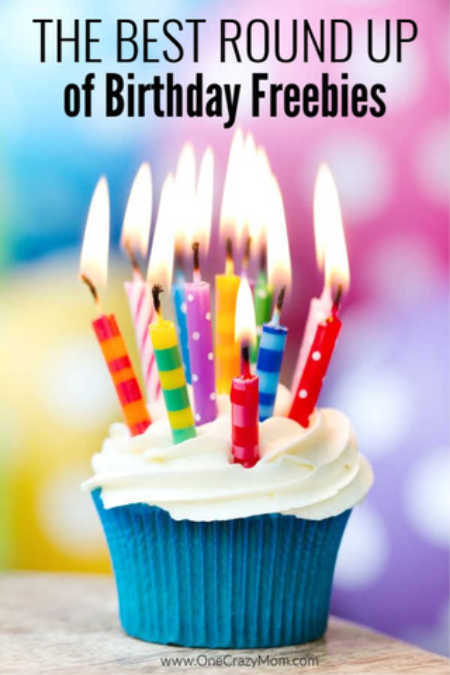 Let’s get started with these amazing freebies on your birthday! We have separated this list by restaurants and desserts. There is also a section just for kids. I would definitely pin or bookmark this list for quick reference when you need it! Just keep in mind that this list could change at any time based on the restaurants discretion. If you have any to add, let us know. The restaurants may change their free offer or free item but it is always a great deal. You will love getting these free items on your birthday. I get just as excited as the kids because don’t we all love free stuff? With so many fabulous places to eat, it might be hard to choose. I love saving the ones that have longer expiration dates for later in the month. I try to use the ones that are only good on my actual birthday for that day. That way we get to enjoy lots of free meals and celebrate longer. Wahoo! IHOP – Join the Pancake Revolution and enjoy FREE Birthday Meals and more! Everyone loves a good dessert and this list has plenty. From ice cream and cookies to cake and more! There are lots of delicious treats to enjoy on your birthday. Give these offers a try that are exclusive to kids. They will feel extra special on their big day. These are the best freebies on your birthday! Let us know if you have any offers to add to this amazing list. We are always looking for new freebies and offers to share. Everyone loves celebrating and what better day than on your birthday! We all love free and getting special treats. 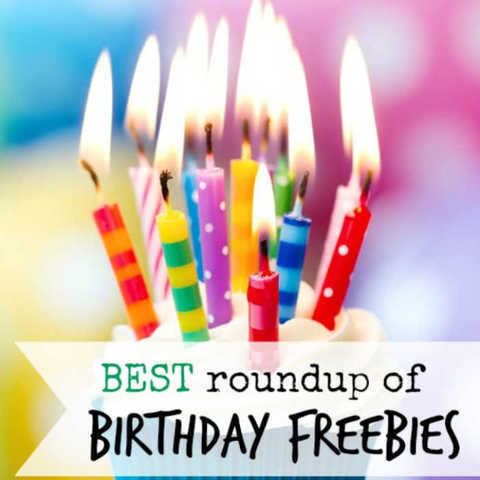 What are your best birthday freebies to snag? Make sure you share this post with your friends too! They will appreciate knowing about all of these awesome deals. Pick out your favorite deals and make sure to sign up. You will love having your inbox full of wonderful treats and free coupon offers during your birthday month. The restaurants love to offer this free stuff and it pays to join their loyalty programs or email clubs. You get perks during the year and often just for signing up. I have signed up with several and got a nice little coupon or free item just for initially signing up. It always pays to join in my opinion. Even if you don’t have all of these restaurants where you life, you might still want to sign up if you will be traveling. We have used coupons on vacation and more to places we would not normally visit because we didn’t have one at home. It is a great way to save and try out new places. It truly is a win all around for everyone. Yeah! Let us know what great freebies you score.